Did you know that the aptly named Havanese is the only dog breed that is native to Cuba? These bouncy, cheerful and very clever little dogs were - legend has it - first bred as lap dogs for the wealthy in the sixteenth century and the ancestors of the modern Havanese were said to lead a very luxe life indeed . However, before they were introduced to the United States some 40 years ago the breed was dying out, having fallen out of fashion in their homeland. However, as many proud Havanese pet parents know, the breed has thrived here and now is a very popular choice, especially with urban apartment dwellers. The Havanese is a clever breed and they are usually easy to train. They're lively, loving and loyal and their gorgeous long thick coat is their trademark. In order to maintain that lovely coat, the Havanese needs to be given a daily diet that not only properly nurtures their little bodies but their skin and coat as well. This can make choosing the best dog food for Havanese seem like a daunting task. But it does not have to be when you know what you should be looking for. These best dog foods for Havanese are far from the only ones you will find out there to choose from, and while they are certainly very suited to most Havanese, every pup is different and a formula that suits many dogs may not always be suitable for EVERY dog, so a little experimentation may be necessary when looking for the perfect dog food for your furkid. Ultimately your Havanese' dog food will have a bearing on his coat, health and temperament. However, there are some basics you should be looking for. The main protein should comprise around 70% of the formula and be from a whole source. Foods that make use of organ meat, as well as muscle meat, tend to offer more of the skin and coat friendly vitamins that Havanese need to keep their majestic fur cloaks in the best possible condition so that is something to watch out for as well. A food that offers a good amount of fruit and vegetable content can be very beneficial as well. If your Havanese is fed a good dry food he does not require supplements of meat or vegetables. Most pups do like a little variety in their diet so you may choose to stick to the same brand but just vary the flavor. Havanese puppies can be switched from puppy food to an adult diet when they reach the age of 12 months. Adult Havanese may only require one feeding a day however, some experts recommend breaking it into two smaller meals. An older dog will require a change in their diet to reflect their sedentary lifestyle and in part to a slowing down of their organs' functioning on par. So smaller portions and easily digestable food is recommended. Look for lighter or ​senior dog diet formula for your older Havanese friend. Finally, a caution on food storage: you must store your dry dog food carefully. 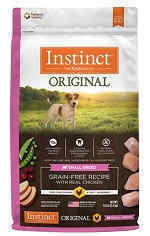 Open packages of dog food quickly lose their vitamin value within 90 days of being opened. Veterinary studies show that a balanced high-quality diet pays off in your dog's coat quality, behavior and activity level. Invest in premium brands for the maximum payoff for your Havanese. The following 5 brands and recipes have been carefully researched to complement your Havanese health and nutrition requirements. 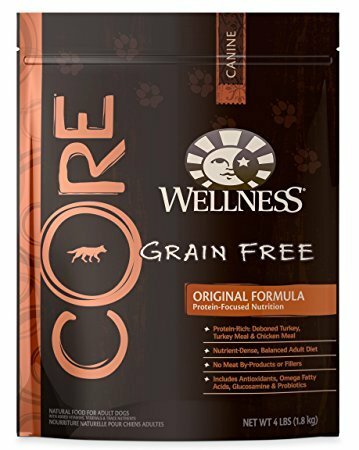 If you are looking for a great dry kibble that is suitable for your Havanese at then it's hard to go wrong if you choose Wellness Core Original Turkey & Chicken. This grain-free formula is specially designed for the nutritional needs of a smaller dog like them (most weigh just 7-13 pounds stand around 8-11 inches tall) and has some components that address some of the rather special needs the Havanese has in terms of nutrition. The first, and sometimes most important for this breed, is that the calorie count for this kibble is little lower. Havanese are prone to becoming overweight and so their diet should be a little more tightly moderated in this respect. The fact that both of the major protein sources in this formula are lower fat, high protein meats will help you do that . In addition to meats, the recipe also contains flaxseed and salmon oil - both of which are packed with Omega 3 fatty acids, which are great for the skin and coat as well as proper brain development and vegetables including carrots, sweet potatoes, kale, broccoli and spinach and fruits like apples and blueberries. This combination of 'superfoods' provides a wealth of vitamins and minerals that are essential for your Havanese' health. Pet parents familiar with this brand and recipe remark often about how shiny and healthy their dog's coat has become since trying the kibble and some report a reduction in flatulence as well (something that's always a plus ) and the taste is almost universally liked, appealing to even the pickiest eater. 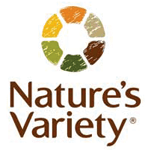 Nature’s Variety Instinct Raw Chicken is another great dry kibble that is grain-free and AAFCO certified to feed small dogs of all ages (from puppy to senior). The use of a very lean protein - chicken - that is included as freeze-dried raw coating - helps not only to keep the calorie count down but provides a more easily digestible protein source that is a little kinder on a small dog's often rather sensitive stomach. The fact that the whole chicken is used - organ meat as well as muscle meat - one the principles behind the 'raw' food movement in dog nutrition - is believed to provide more vitamins and minerals, but there are also plenty of those provided by the 30% of the formula that is made up of fruits and vegetables. Flaxseed and salmon oil is also included to boost the Omega 3 fatty acid content, something that is beneficial to the coat and skin as well as to the eyes and brain . Fans of Nature’s Variety Instinct report the fact that their pets seem to really love the taste and that it does seem to help them remain in svelter shape. The food also receives top marks for the improvement in skin and coat quality that a number of pet parents noticed after switching from another food . Most pet parents do like to be able to offer their dog a combination of wet and dry food but finding the right wet food can sometimes be a challenge, as many are not as meaty as most owners (and pups) would like. The Solid Gold brand has been a favorite with small dog owners - including Havanese pet parents - for decades, and, it seems, for good reason. The chicken included in the Solid Gold Sun Dancer wet food formula is organically sourced and the whole chicken - muscle meat, organ meat and broth - is made use of, offering just the right amounts of protein to meet a smaller dog's needs. 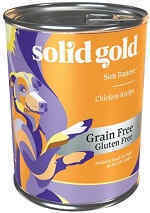 Solid Gold then adds their famous '20 superfoods' which includes pumpkin, carrots, blueberries, salmon, sweet potato and broccoli and is designed to provide the right vitamins and minerals - in the right 'doses' to keep a smaller dog's body healthy and their skin and coat shiny and healthy too. Sun Dancer Chicken - like all of the foods on this list - is grain free but in this case, there is also no gluten present, something that may be helpful for dogs prone to food allergies . In fact, the additives are kept to a minimum in general and there are fewer than many of the competing wet dog foods on the market. 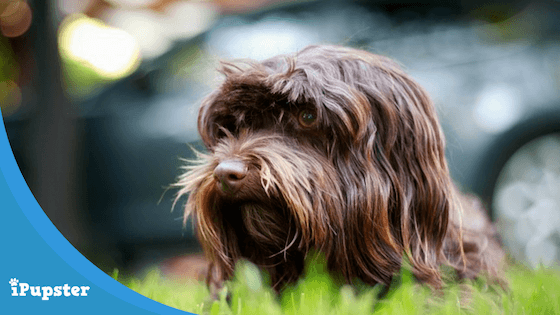 Owners who feed their Havanese this premium wet dog food report that the taste seems to be very popular with their pets and some note a definite improvement in the condition of their pup's coat after choosing to switch from another brand. Like many small dogs, the Havanese is very often a very active little pup, seeming to have boundless energy at times. This formula is designed to meet the nutritional needs of the livelier small dog without adding fillers and bulk that offer little nutritional value but could contribute to excessive weight gain. The primary ingredient is a lean meat - chicken - and it provides just the right amount of protein for a small dog. This is especially important as too much protein can sometimes be as bad as too little, and dog food designed for larger dogs may provide too much. The kibble is fortified with a wide range of vitamins and minerals, including Vitamins A and C and biotin, a water-soluble B vitamin that is known to be exceptionally good for the skin and coat . This is not, however, a grain free food as it contains both wheat bran and whole grain corn. This may be off-putting for pet parents who have become accustomed to feeding their pups a grain free diet but this formula's many fans feel that it is especially good for small dogs with sensitive stomachs - especially those prone to diarrhea . It's not just clever marketing; according to vets and animal nutritionists puppies really do benefit from being fed dog food that is specially formulated for their developing bodies (and brains) Blue Buffalo Freedom is just such a formula and it is currently one of the most popular choices for puppies among Havanese pet parents. The formula is completely grain and gluten free, something that helps to avoid the digestive issues that small breed puppies can be prone to. The main protein - chicken - is organically sourced and is flash frozen raw before being added to the kibble. A wide range of fruits and vegetables are also featured in the formula - including carrots, sweet potatoes, blueberries, cranberries, apples, blackberries, pomegranate, spinach, pumpkin , and dried Kelp along with salmon oil and flaxseed to provide additional Omega 3 fatty acids. Omega 3s are especially good for puppies as they not only help with coat and skin health but are essential to proper brain development as well. 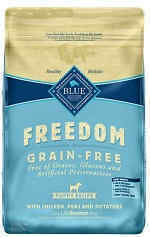 Blue Buffalo Freedom Puppy is recommended for use by a large number of veterinarians, breeders and shelters and this is how many of the pet parents who have reviewed it came to choose it. Few were disappointed with their choice however and have been so impressed with the food that they stuck with it - in adult form - once their pups grew up. This is a condition common in certain small dogs that involves the blood supply to the femur being somewhat inadequate that can, over time, lead to the head of the femur becoming degraded, leading to a difficulty walking. Proper nutrition can play a vital role in preventing this scenario. Dog food formulas that are rich in calcium, as well as in Vitamin D and Vitamin K enhance bone growth and bone strength and Omega 3s can do the same. Read more about this condition from Orthopedic Foundation for Animals. Havanese are far from the only dog breed that is prone to developing cataracts as they grow older and while not all cases can be prevented the right nutritional plan can help delay their onset and decrease the severity. In dogs, the most common cause of cataract formation is genetics. The second most common cause of cataracts in dogs is diabetes mellitus. Other causes of cataract formation include trauma, intraocular inflammation and nutrition. Beta-carotene is essential for good eye health and is found in large quantities in sweet potatoes, carrots, apricots, broccoli, and peas. Lutein is another key to eye health and that is found in the largest concentrations in pumpkin, broccoli, carrots and kale so dog food formulas that contain these ingredients will be particularly good for maintaining your Havanese' sight. Although they are lively little pups the Havanese is genetically predisposed to gaining weight, and often a little too much of it at that. To combat this pet parents should be mindful of calorie counts and get an idea of their pup's ideal weight from their vet and then formulate a feeding plan that will help them maintain that ideal. The dog foods chosen here all offer the nutritional elements that meet - and even exceed - the basic standards the Havanese need to maintain both the highest levels of health possible and to maintain that shiny, silky, beautiful to the touch coat that is one of the biggest trademarks of the breed and therefore we encourage you to give the one most suited to unique pup a try the next time you are making feeding decisions.